Nite Owl Creates: California Christmas Pinterest Party! The Pinterest party I've been greatly anticipating for weeks (minus being focused on Thanksgiving and Black Friday shopping) had arrived and it did not disappoint. Here are some pics of the before and during so take a look at what we made and ate! Even with a large craft room it's sometimes hard to find spots for all the things. Feeling like I need a redesign inside but its all good. I make it work and I also made these cute swag bags with gift bags and tissue paper from Hobby Lobby in Idaho. Ah, so fun to put these together! The chalkboard sign needs some work but it was a fun idea at least. 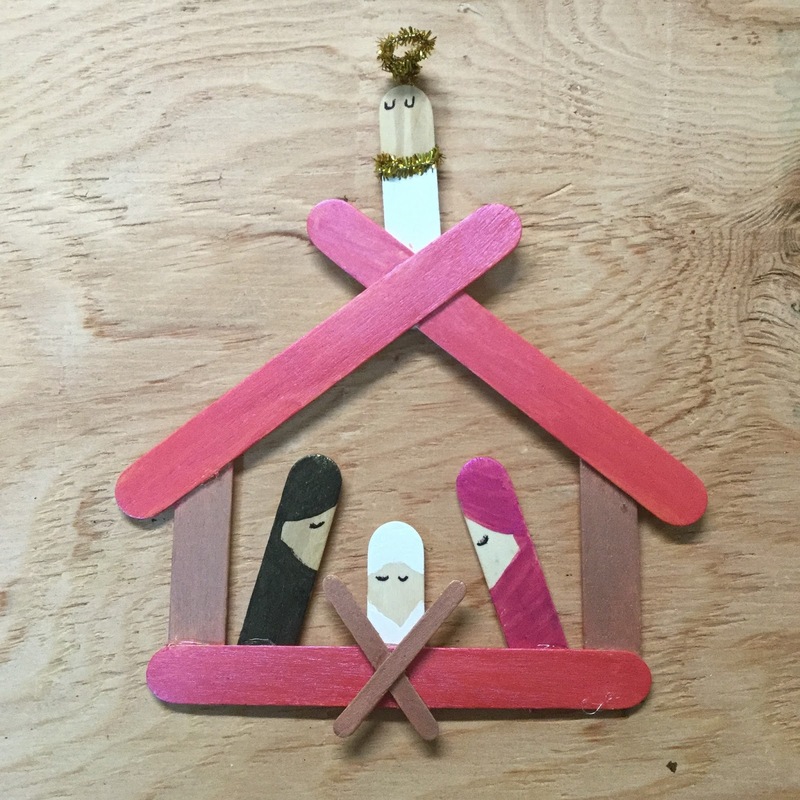 My friend Stacy found this popsicle stick nativity from Pinterest and came over to prep it before the party. 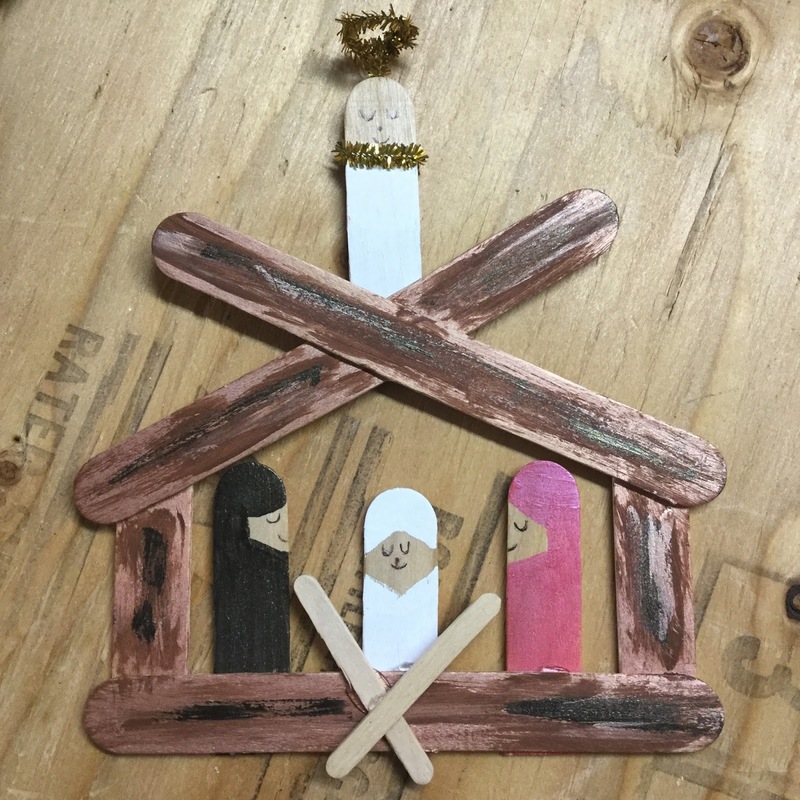 We decided to glue the stable together so that all people would have to worry about doing was painting the Mary, Joseph, baby Jesus and the angel and gluing them to the stable. They turned out so nice! Sarah brought these corks to make cute cork Christmas trees and they turned out pretty adorable! There are quite a lot of crafty ideas for corks on Pinterest. Who knew! Everyone got a glass block and could pick what vinyl they wanted. I had 100 count string of lights for each block which I think was a bit much. Go with 50 count or less or else it gets toot hot. Thanks to Wendy for alerting me to that fact and I was able to share it on our Fb event. Everyone got creative and clever with their blocks - I love the bows and decorations everyone came up with! Pull apart pizza bread made in a bunt pan with maranara dipping sauce. I think if I make it again I would layer the ingredients instead of trying to mix them all together. The ingredients were tricky to mix in the bowl and the cut up pieces of pizza dough wanted to stick to each other despite the other ingredients that had been added. We ate about half of it and Tony has been slowly eating the rest of it. Wendy brought this yummy appetizer...those tortilla chips shaped like little bowls, guacamole, half a cherry tomato with cheese sprinkled on top. Hot chocolate bar! This is something I really wanted to do when I was thinking about what foods to have. There was hardly any hot chocolate left at the end of the night. I had white chips, mint chips, butterscotch chips, Andes mints, candy canes and marshmallows. I only had to buy the marshmallows, candy canes and mints. The crock pot hot chocolate was a hit and I will be making it again next week! Before people left they were able to pick a unicorn ornament if they wanted to. Thanks to everyone who made an effort to come and contribute to make a successful party!